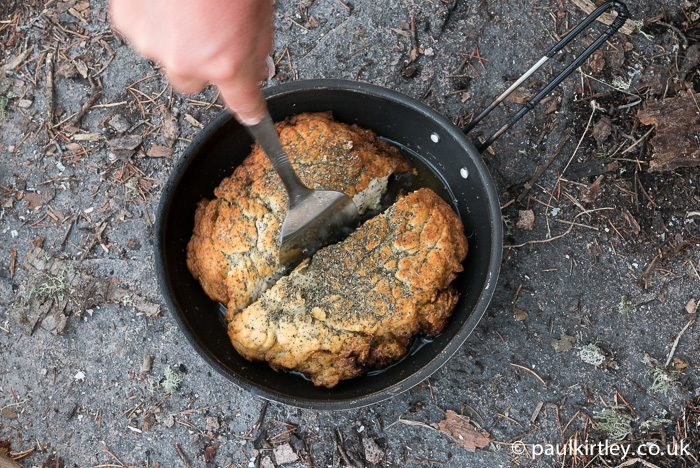 How to make garlic pan bread on a campfire was something I needed to find the answer to. 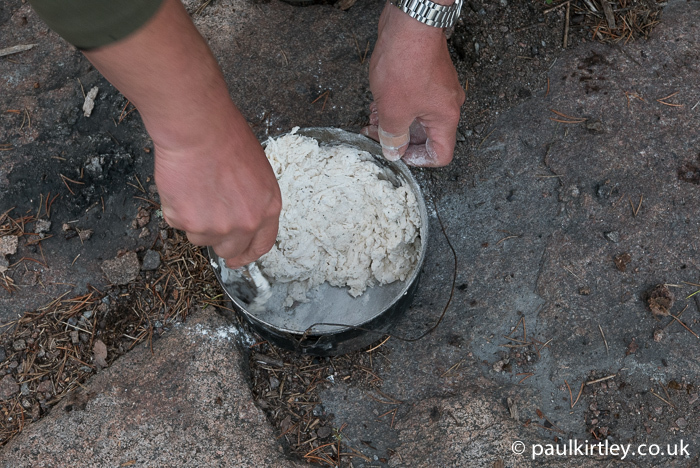 Or, at least, I wanted to work out how to make a good garlic pan bread on the campfire. I was working from first principles and had only basic ingredients available. 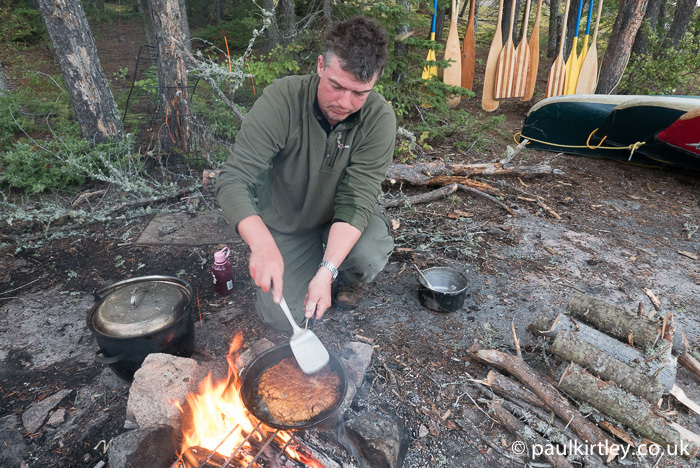 When we undertook a journey on the Bloodvein river in 2014, we had a number of pre-packed fry pan bread mixes from Cache Lake amongst the food packed for the 14-day journey. In 2015, we returned to Canada for another journey on this wonderful river system. 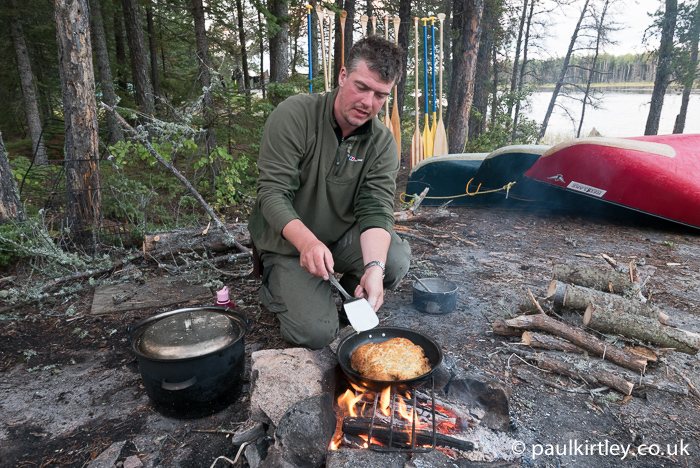 We were disappointed to discover, however, that the Cache Lake fry pan breads were no longer available from the outfitter. Something to do with import or food regulations he told us. The previous year, these pan breads had become a firm favourite and part of our daily routine. 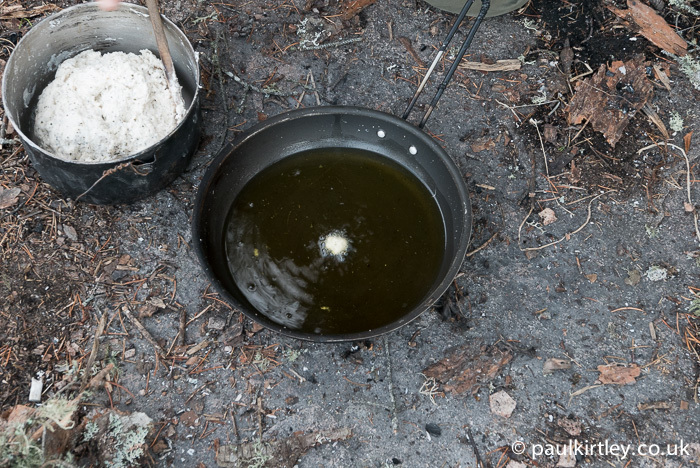 We’d set up camp, get a fire going, get the kettle on and, while the kettle was boiling, make up a mix of pan bread. This would then be cooked off and we’d have a piece of tasty, somewhat greasy, pan bread with our pint mugs of tea before cooking dinner proper. 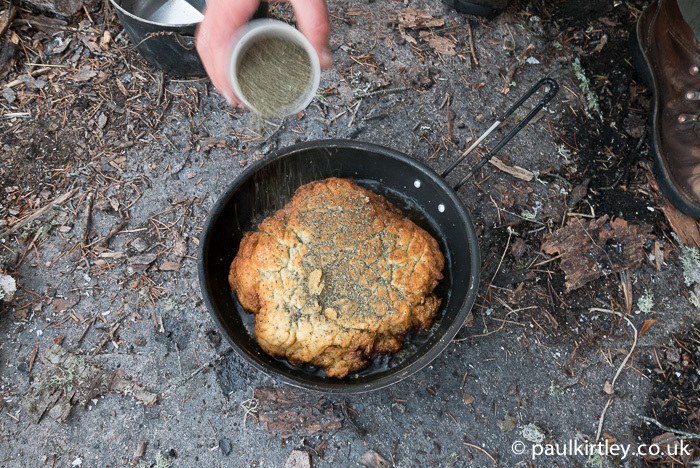 At the end of a day’s paddling, this combo of bread and tea was a good way to perk ourselves up. It started the process of getting fluid, carbs and fat back into our bodies. It became part of our daily routine. On the days when we were particularly weary – after a long distance or working into a headwind for most of the day – the pep up our brew and bread provided was significant. 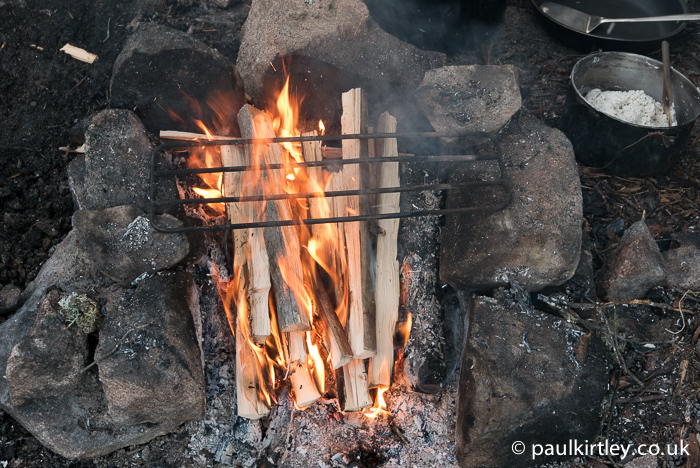 With renewed energy, we could then get on with sourcing and splitting more firewood, preparing ingredients and cooking dinner, discussing the plans for the next day, and so on. So, with the absence of the pan bread mixes but plenty of flour, baking powder and a variety of herbs and spices in our wanigan, I set about making an equivalent to our favourite from scratch. After a few goes, not all of which proved as successful as I would have hoped, I arrived at a formula for making a garlic pan bread that worked. And it worked consistently. Some might even call it a recipe. This quickly became a favourite and the speed of production decreased dramatically. 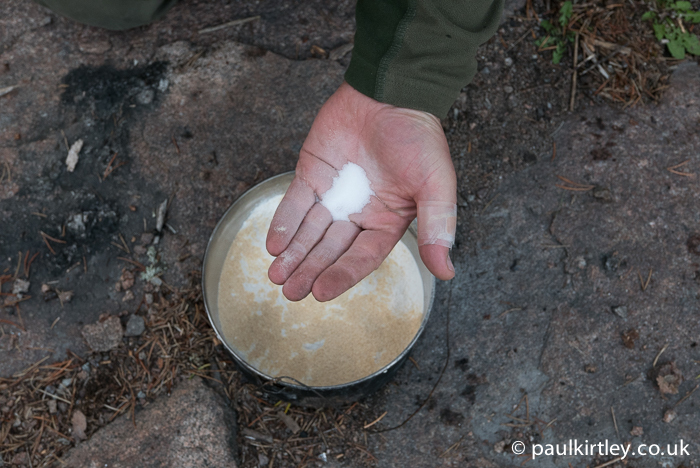 We most often had it as a snack, not long after arriving at our camp but sometimes it was saved to accompany our main evening meal. 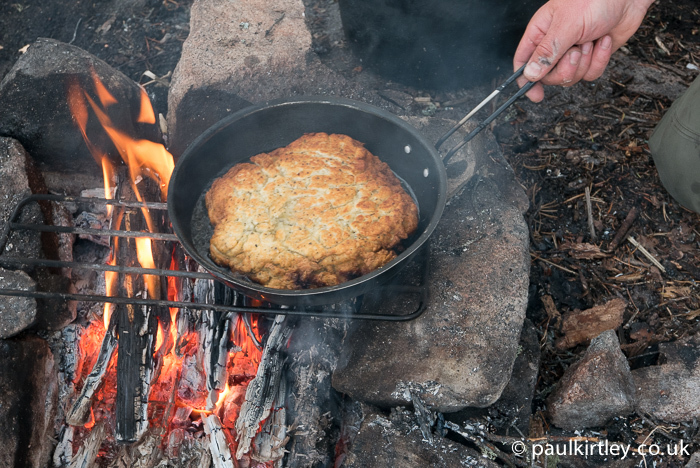 Below is my recipe for garlic pan bread over a campfire. The photos were taken one evening during the 2015 Bloodvein river trip. First, the ingredients you need, from top left to bottom right – garlic powder, basil, black pepper, salt, olive oil, baking powder and flour. Photo: Amanda Quaine. Pour six good handfuls of flour into the mixing pot. Photo: Amanda Quaine. Add two healthy palmfulls of garlic powder. This is garlic bread after all… Photo: Amanda Quaine. 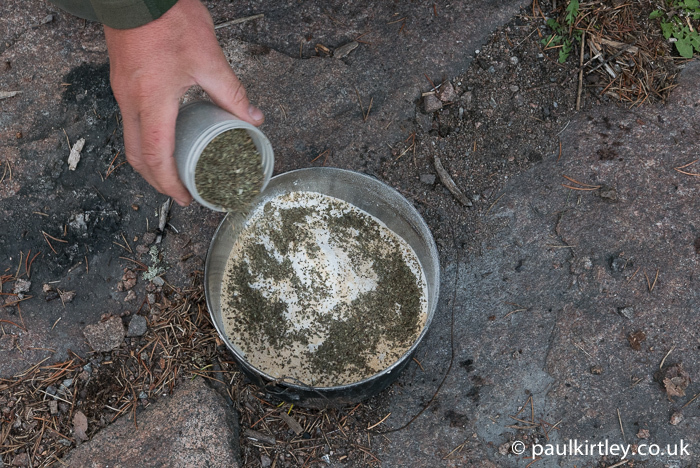 Add a good shake of dried basil. Photo: Amanda Quaine. Next, mix all the dried ingredients so that each is evenly distributed in the dry mixture. Photo: Amanda Quaine. 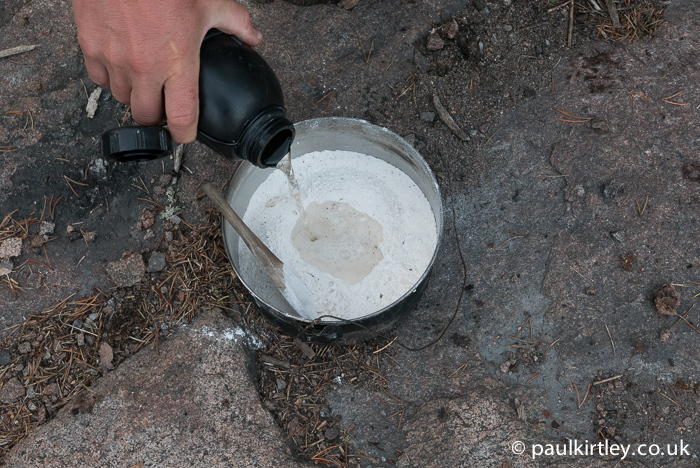 Make a bit of a well in the centre of the dry mix and add some water – only a small amount to start with. Photo: Amanda Quaine. Start to mix and make a dough. Photo: Amanda Quaine. 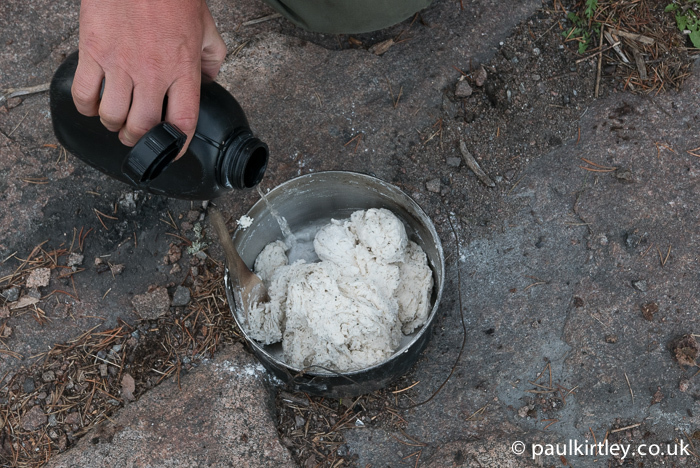 Once the flour and initial water is as consolidated as possible, add some more water. Photo: Amanda Quaine. Again mix in the water. The aim is to achieve a good, solid dough. Photo: Amanda Quaine. This is getting there but still a little dry. Photo: Amanda Quaine. Adding just a touch more water. It really doesn’t need much now. If on the other hand, the mixture had been a little too wet in the previous photo, we could add a dusting of flour at this stage to dry it a little. Photo: Amanda Quaine. This is looking good. Solid, not too sticky and ready for the pan… Photo: Amanda Quaine. 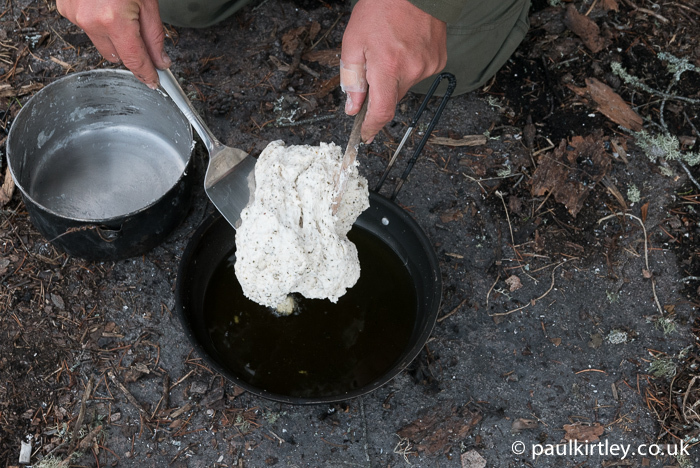 Once the dough is sizzling, take the pan off the fire and set it down on a flat, stable surface (usually, the ground works just fine). Photo: Amanda Quaine. Squash the dough down flatter and wider. Photo: Amanda Quaine. Put the pan back onto the heat. Photo: Amanda Quaine. 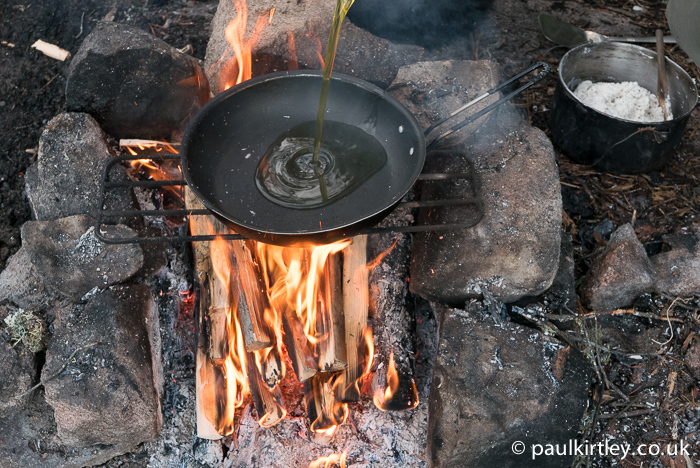 Keep pushing the dough down into the oil and bringing oil up on top if you can. 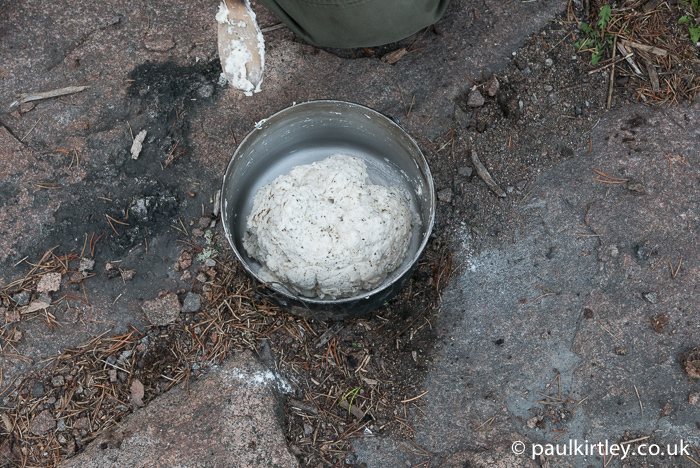 Also, rotate the bread within the pan, as there will undoubtedly be hot-spots in the fire, which mean some parts of the base of the bread will cook more quickly than others. You don’t want to burn it. Photo: Amanda Quaine. As well as rotating the bread within the pan, regularly check the underside to make sure it is not cooking too quickly or even burning. Photo: Amanda Quaine. Once both sides are browned, turn the bread back to the first side again. 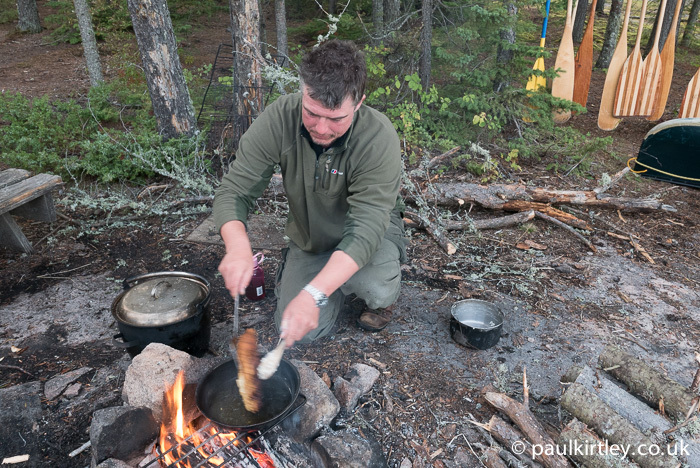 The fire will have died down a bit now and you can make sure the bread is cooked through. Photo: Amanda Quaine. This bread is looking good now and I’m just finishing heating it through. Photo: Amanda Quaine. Remember to keep rotating the bread in the pan as well as checking the underside. Photo: Amanda Quaine. 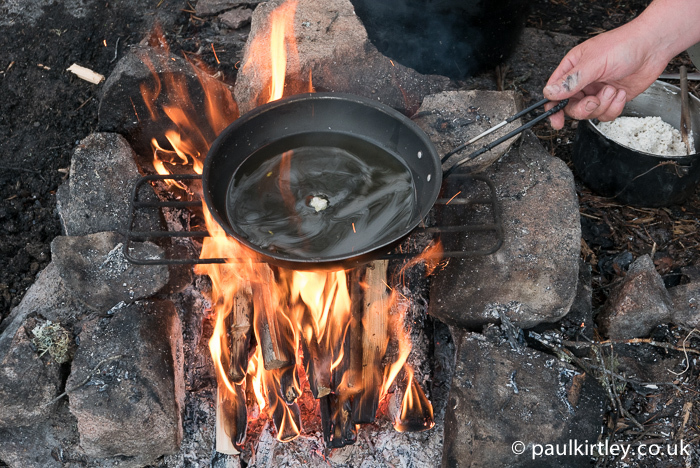 Once the bread is ready, take the pan off the fire. Photo: Amanda Quaine. Looking good and ready to eat. Photo: Amanda Quaine. 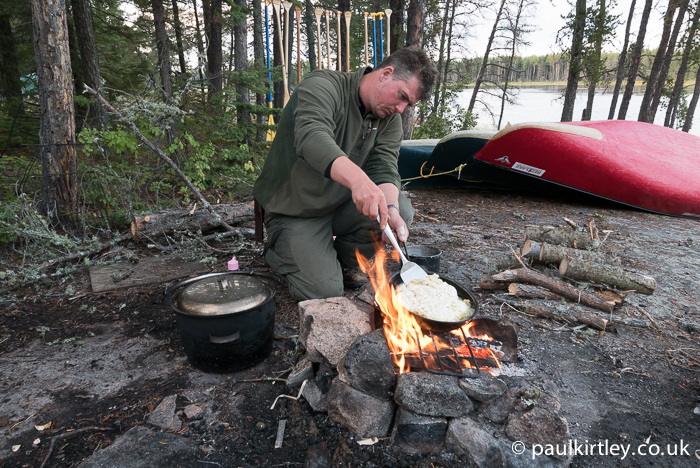 When on trips, where everyone is working hard and inevitably hungry at the end of the day, it’s important to share food out fairly, so rather than people just pulling chunks of bread off, I prefer to divide it up more geometrically… Photo: Amanda Quaine. 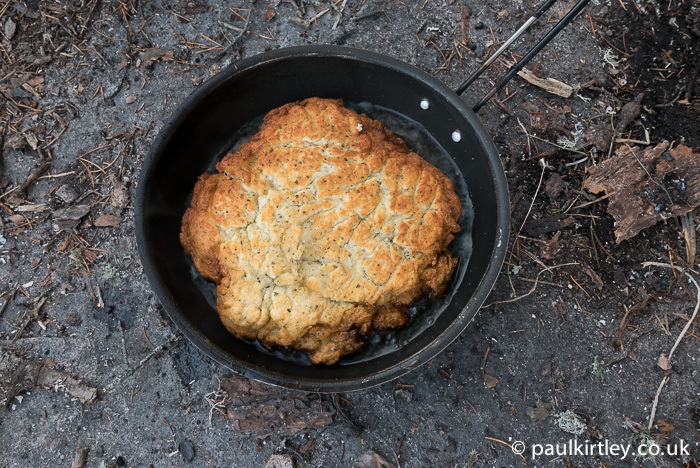 Pan breads of this type are quick and easy to make, adding a great element to your camping menus. The are delicious, punching above their weight in terms of flavour. They are also both filling and calorific, providing not just carbohydrates but also fats, as well as replacing salt. 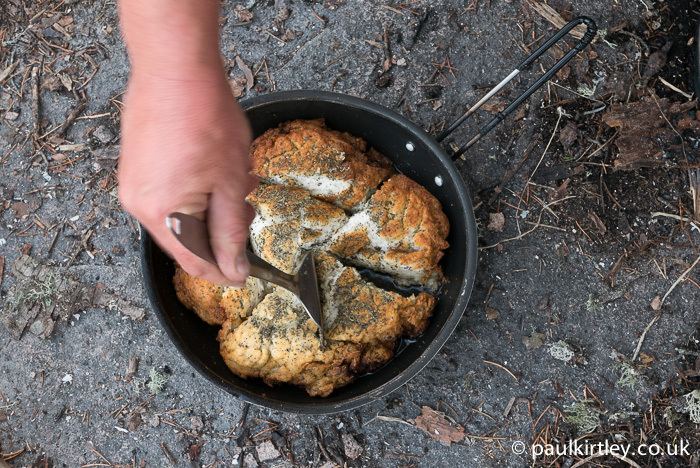 The garlic pan bread proved a firm favourite on our canoe journey. I’ll definitely be making them again on future trips. Hi Paul, looks great! Just wondering if the ingredients can be pre-mixed before hand and the mixture taken on trip rather than all the ingredients individually (save on packing space etc)? The dry ingredients can be pre-mixed ahead of time. I usually do this when I go camping. Thanks for the confirmation Andy. I know sometimes ingredients cant be premixed (such as bread, the salt kills the yeast) so thought it worth checking before I go out and bake myself a brick! I sometimes do this but on longer trips prefer the flexibility of keeping them separate. 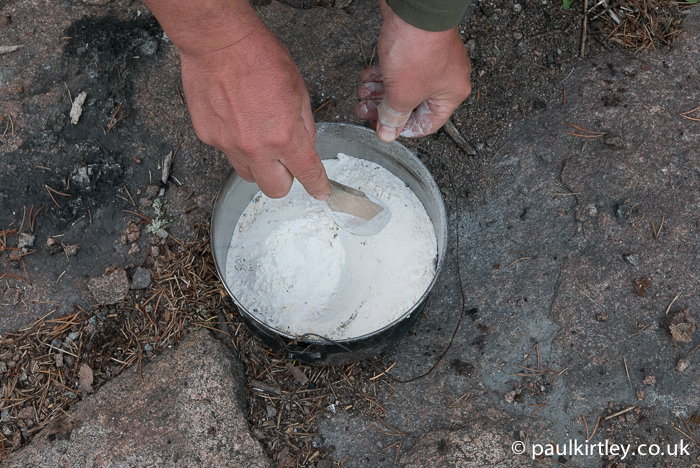 Carrying flour, baking powder, powdered milk, powdered egg, salt and fat, you can make pan breads, bannock, flat breads, pancakes, dumplings and more. Yes, you could if you have planned your meals that way. 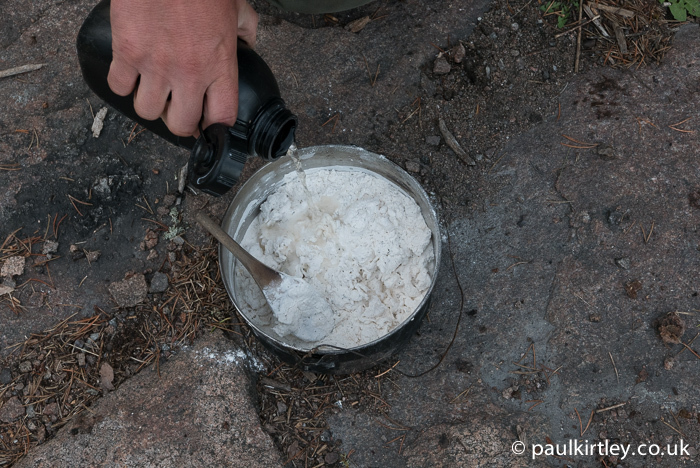 But as I’ve mentioned elsewhere in this thread, on the longer trips I prefer the flexibility of keeping the ingredients separate – same as in the kitchen. Thanks for this article! That looks delicious! From there, you can add anything you like, really. 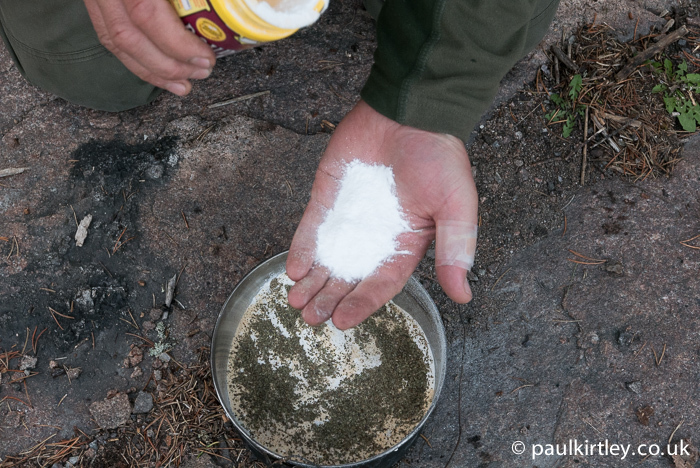 I like to add 1/4 teaspoon of oregano (a little goes a long way!) to add an Italian bread flavor, and some chopped onions, as well as garlic. Sometimes I will cube some summer sausage as well and add it to the mix. I will definitely have to try the basil! You mixed your bread with very little water. That helps keep clean up to a minimum, since you don’t have dough sticking to everything. I use more water than you do for 2 reasons: I have found that my bread cooks faster with a little more water, and secondly, bread made from drier dough gives me a stomach ache. If I add a little more water, the bread is much easier on my stomach. We often add dried fruit to this, which as well as providing a nice taste, helps keep the bread moist for longer if not being consumed immediately. If we don’t add fruit, then a teaspoon of sugar can help improve the taste. This mix goes really well with bacon in the mornings. Great, thanks Paul a new recipe to try out. This very similar to the recipe (if you would call it that) I use or show others. 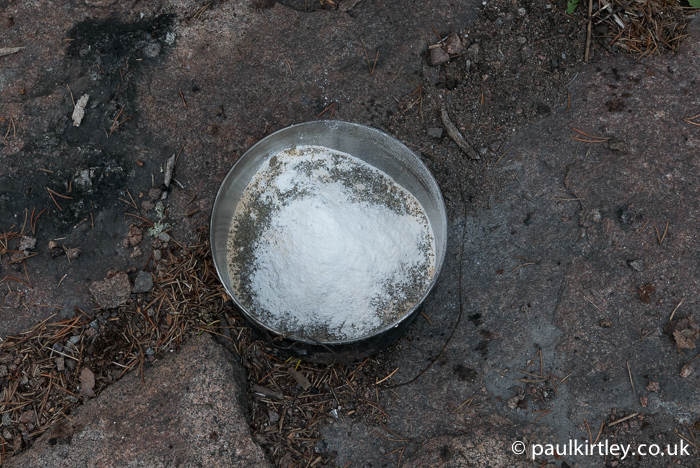 I tend towards self raising flour so I don’t need baking powder, and one less thing to carry. I add sugar. if feeling flash I like to add brown sugar for a fuller flavour. Then add in dried fruit or herbs depending on preference. Thank you for sharing this article! This is something I’m willing to try out very soon. We once ate a frikandel (dutch meat snack which is usually fried) with syrup at 7 in the morning. We ended up with the snacks and syrup which I had in my backpack because the lack of space in the other bags. So there we were, standing in our underpants at the campfire. Drying out all our clothes, sleeping bags, phones and torched and one of us making a paddle from wood. 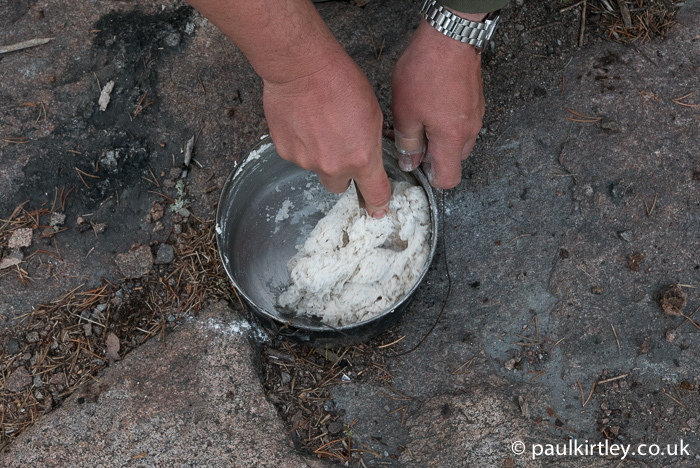 We managed to catch a trout so we eat that, which was nice! Leaving the snacks and syrup for breakfast. We still have our improvised wooden paddle hanging at the café of our campsite, reminding us and others to go well prepared! None the less, best canoe trip ever! 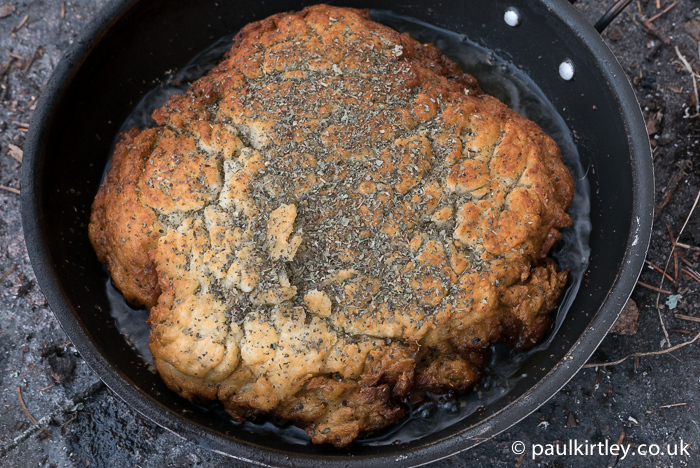 Let me know how you like the pan bread when you try it. Pan breads are a favourite of mine! Thanks for sharing this recipe it looks yummy and I shall try it soon..
Let me me know how you like it. This recipe didn’t sound like much, but as I looked at the pictures, my mouth started to water. I am going to try this in the backyard first, and next spring I hope to good at making them for real camping. Thanks again for a great blog. That looks awesome Paul. I think this is one recipe I will try for sure. Hi Paul. 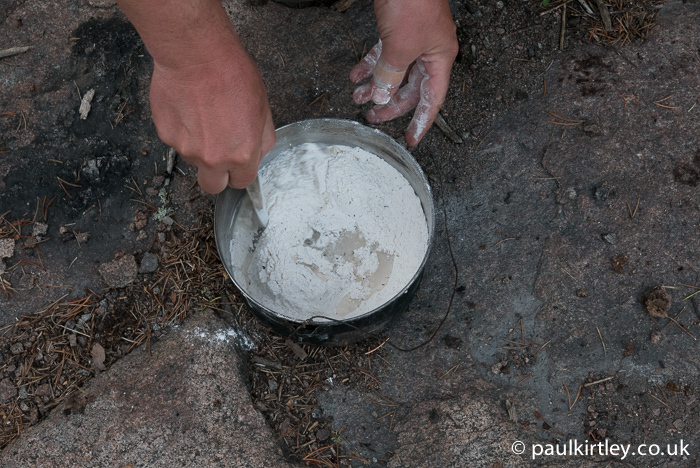 Love the bannock recipe. 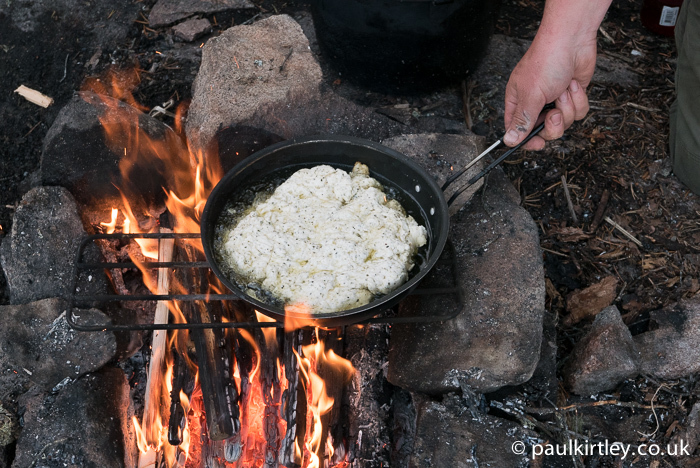 Bannock is something we often make with the Scouts in our troop, they really enjoy cooking it over the open fire. Hi Paul I enjoyed your blog and recipe. I’d like to add a couple. I premix every thing but the water. Along with the flour and baking powder I like to toss in mixed fruit brown sugar and hot apple drink mix . Tastes awsome. For a breakfast one I’ll put in garlic powder and cooked pieces of bacon. bread is best cooked slow and off direct fire. Hi Paul, wonderful article as always. I use the same “recipe” as you do for a base with different combinations of herbs except with non wheat flour mixtures (medical issues). 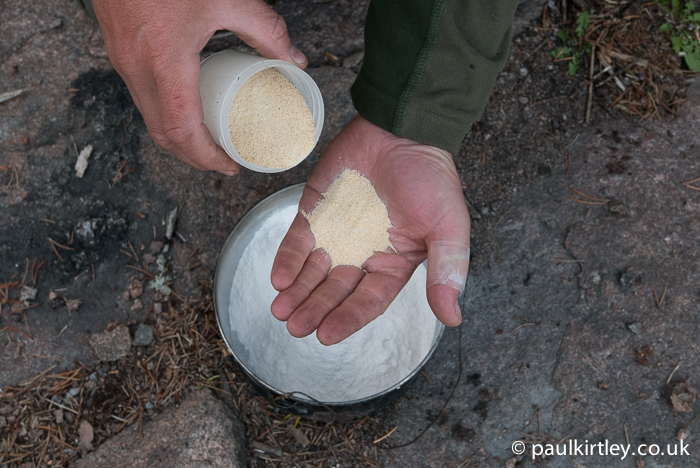 One thing I do change up is I use half of the flour and add cornmeal which I usually carry for dredging fish in. I use different herb mixtures and even mix it with wild green onion tops or dehydrated if necessary and rehydrated yellow onion and some honey crystals. This looks like a good recipe that i want to try, would you think i could try and cook this on a Jetboil stove and pan as well as on a campfire? That’s a neat recipe. 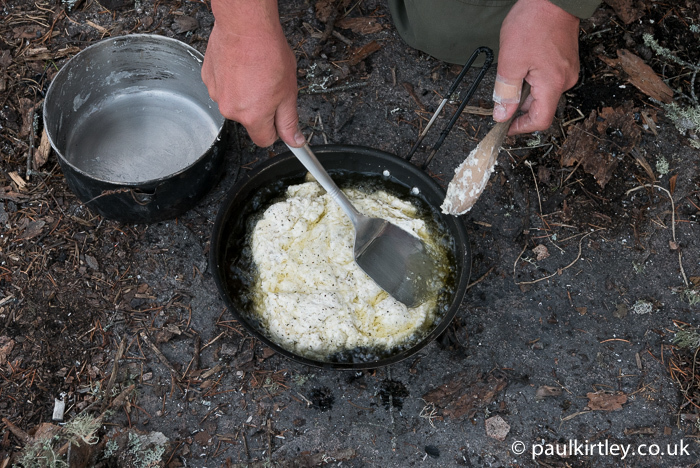 Have often made pancakes while out camping…going to try that one. Let me know what you think Craig. Hi Paul: I really enjoy your blog. I have read articles for 2 yrs and have never heard anyone talk about what to use for cleaning your dishes, and pans after a meal. Also what would you take for various cleaning items in a SHFT situation. That sounds really good, Paul, I’m going to have to try it soon. This is my favorite fry bread, I have small hands so converting might be tricky. I usually plan on 2 servings a day. It also make a great trail pizza with a sliced mozzarella stick, some pepperoni slices and dehydrated tomatoes. 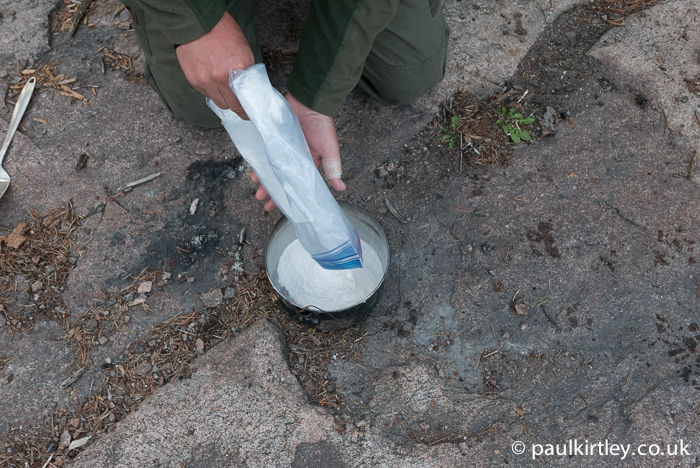 ½ c of mix makes 2 servings, individually package in freezer bags with instructions. When ready to fry, add; 1 tsp. vegetable shortening, ghee, olive oil, lard or bacon fat to each 2 serving bag. Mix ingredients in the bag, add water to enough water make a dough. * Let rest for 10 minutes. Cut off a corner of the bag and squeeze into a pan to make 2 servings. 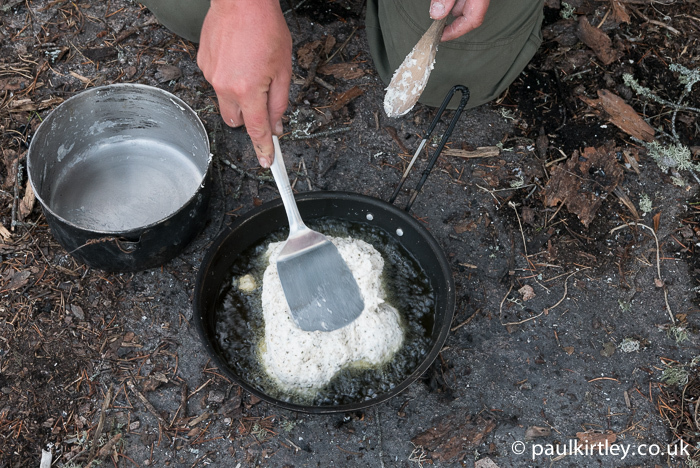 Bake in a fry pan coated with oil or a fat, flip when needed. It is done when it sounds hollow when tapped. Add dried fruits, nuts, cinnamon, foraged fruit, bits of cheese or bacon if desired. Serve with ghee, olive oil, syrup, honey, or press out thinly in the pan, fold over and make grilled cheese or pizza pockets. *Note, for lighter fluffier type of bread, mix 1 tsp. apple cider vinegar before adding water, it will react with the soda and baking powder. Steady on! I’m sitting here recovering from the intense exercise and stress of my first Webinar and you’re talking food – I’ll be scoffing all night if I start now. 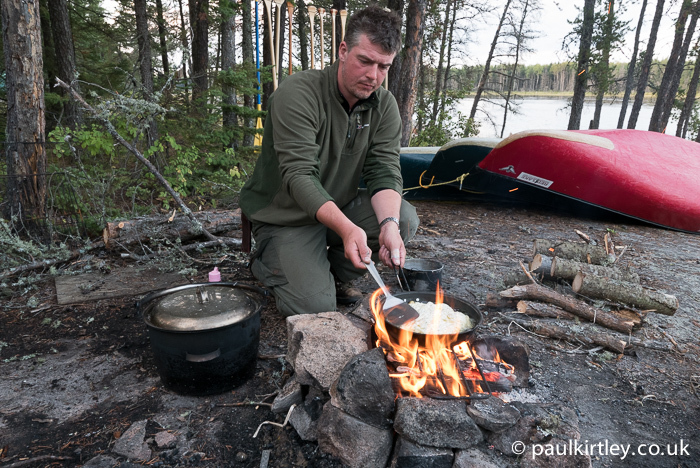 Thanks to all who’ve shared recipes as I’ve lots of variations and ideas for Scout summer camp now. Hope you enjoyed the webinar and found it valuable. I’m going to have to try this next time I’m in the bush. The tins used are they aluminum? We also need to see how you make your coffee! I just wanted to thank-you for the recipe. I made some spaghetti for the adults in our Scout troop and this was a perfect side. Though I adapted it somewhat by mixing a generous helping of grated Parmesan cheese into the dough and then melting some mozzarella on top. Hello Paul. 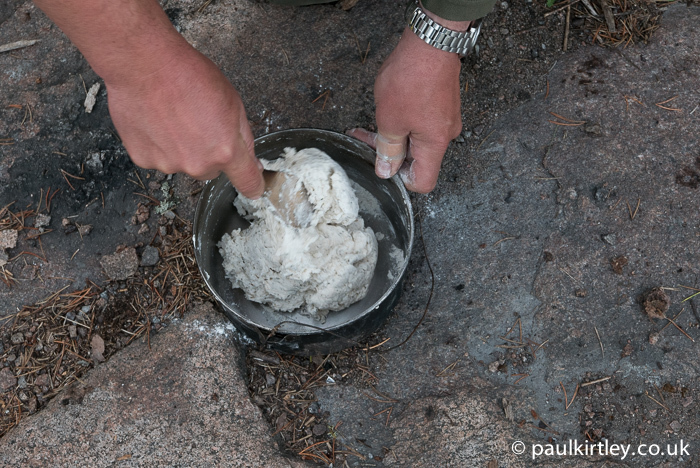 I make bread a lot in tbe outdoors and I’m always keen to save a bit of washing up. 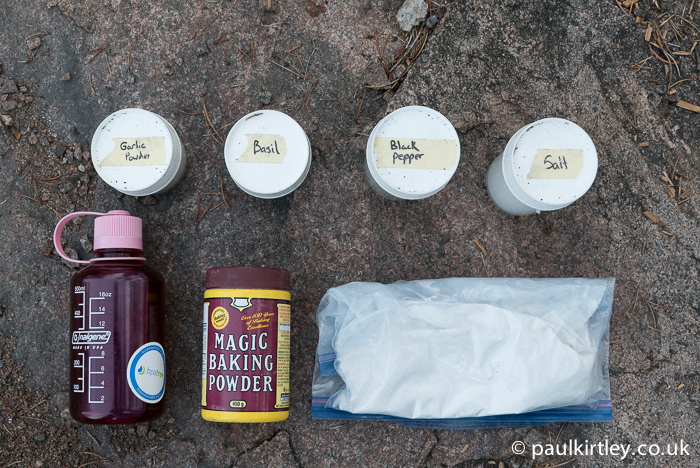 I mix all my ingredients inside the Ziploc bag, massage it all together ….can be left to prove in it by the fire for a bit too. I’m aware that a good number of people either pre-mix into zip-locs at home and/or use the bags for mixing in the field. I understand the benefits in terms of convenience but personally I don’t like pre-mixing ingredients except on very short trips (1 or 2 nights) where there is a rigidly fixed menu. On longer trips there is more room for flexibility. Also, with client trips, I don’t always know what everyone’s taste is going to be. If I had pre-mixed garlic into all the bread mix and then one of the clients I am guiding hates garlic, then we have an unhappy client for two weeks! Second, I try to minimise the number of plastic bags I use for environmental reasons.